Byron Janis was born in 1928 at McKeesport, Pennsylvania. His zenith appears to have been during the 1960s. He was of the same generation as Van Cliburn, Graffman and Fleisher – the latter also suffering problems with his hands. Janis’s triumphs in Moscow during the height of the Cold War left an indelible impression as a result of the recordings made there. In 1973 he was afflicted psoriatic arthritis in both hands and wrists which ultimately brought his performing career to a close. His last recording was made in 1970 for EMI. In 1986, he became a spokesperson for the Arthritis Foundation as its National Ambassador to the Arts. He wrote the music for a musical theatre production of The Hunchback of Notre Dame and also composed the score for the film-documentary The True Gen: Cooper and Hemingway – a 20 Year Friendship. He married the daughter of Gary Cooper. A student of Horowitz for three years, phenomenally gifted and celebrated he made a handful of LPs for Mercury Living Presence. His technical team was led by Cozart and Fine and their triumphs on location in Moscow and in London and Minneapolis are reflected in this set of analogue originals. The wallet style box has muscular claims on your bank account now that the five individual Mercury CDs are difficult to lay hands on. Janis has a resounding touch as well as opalescent delicacy when required. He is recorded close-up and personal and is superbly partnered by the London Symphony Orchestra and Dorati in Rachmaninov 3. Janis rips into the part with awe-inspiring technique and artistic yield. Nothing is allowed to pass as commonplace whether limelight melody or chuggingly stolid ostinato. To sample the best from among the best try from 10:40 in the finale of No. 3. Dorati draws a crackingly coordinated barking report from the LSO brass at the start of the finale. 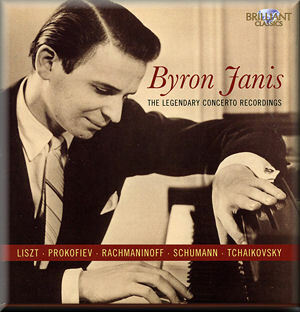 Janis’s Rachmaninov Second begins almost impassively - certainly modestly. The weight of the Minneapolis strings instantly captivates as it also does in the precise stereo by-play of the finale. Janis tends to be less than probing in the middle movement and he is not helped by a vibrato-laden flute. No such reservations about Janis’s Rachmaninov No. 1 which has all the volatility, fire and heady poetry of the Third. The shrapnel dazzle and euphoric tumbling complexity of the finale is glorious. Much the same applies to the Prokofiev 3 with its echoes of Walton in his Sinfonia Concertante. Kondrashin drives the Moscow Philharmonic Orchestra mercilessly but has time for gawky charm in the middle movement. Janis has charisma in spades in the finale. The Schumann and the Tchaikovsky are in the same exalted league. Again the pianist’s breathtaking skills, the spot-on yet life-enhancing orchestral contribution and the recording all conspire to make this a special listening experience. There’s nothing anonymous about this music-making. An almost cosy Arabeske is sandwiched between the two concertos. For fear that my earlier comments might have you concluding that there is insufficient dynamic contrast you need only listen to the whisper quiet Andante semplice to be reassured. The fourth and final disc offer the meretricious yet sentimentally entertaining two Liszt concertos which Janis despatches with all the élan and tireless confidence you would expect. The Second Piano Concerto is a finer work with more musical substance and it again shines in the hands of Janis and the Rozhdestvensky whether in elfin display, thunderous triumph or melancholy swoon. The recording in this case brings out a certain shrillness in the more demonstrative movements. The Pictures bristle with grainy character and phenomenal virtuosity. It shines from an artist who seems to have no need to struggle with technique. Microphone placement is ideal for it picks up detail in a glowing macro focus that reminds me of the best of Decca recordings of the 1960s and 1970s . These are drawn from analogue tapes and the music signal is underpinned with a soft hiss – more a cradle than a distraction. Satisfying notes from Ates Orga. I doubt you will again see these fine recordings as inexpensively and as classily packaged as they are here. These are classic fifty-year-old recordings of performances without a hint of autopilot about them. The set demands your consideration.